Is Anderson just trying to please Congress by reducing “money-losing” operations so he can look like the kind of fiscal tough guy currently in fashion in Washington? Or maybe Anderson is being tactical rather than strategic, plotting to trim the scale of the long-distance system to fit the dwindling fleet of serviceable rolling stock that remains available for this class of service? Those are all good questions, but they’re also mostly irrelevant. Amtrak CEOs can do pretty much anything they want without explaining their reasons, because Amtrak occupies a peculiar organizational position that leaves it largely unaccountable to the people and institutions that make the nation’s transportation policy. Unlike the federal government’s other three transportation responsibilities—highways, civil aviation and waterways—Amtrak is not positioned alongside the Federal Highway Administration, Federal Aviation Administration and United States Maritime Administration on the USDOT org chart. It is not equal to those three agencies in status, budget, access to the Secretary or influence on national transportation policy. Most important, FHWA, FAA and MARAD have missions, among them, building infrastructure. Instead, Amtrak is a federally owned corporation with no explicit mission except that of making a profit, at which it inevitably fails because it must compete against these two stronger agencies that earn no profits (and aren’t required to) and thrive on huge government subsidies that dwarf that of Amtrak. With no goals, no growth strategy and no meaningful success/fail criteria, Amtrak’s management is left to freestyle. Any set of interests powerful enough to get its paws on Amtrak can play with it—and they do. The reason why Amtrak is subject to so many influences is simple: The U.S. has no passenger train policy. Absent a policy and a bureaucracy to administer it, passenger trains have no theme, no role in the nation’s pursuit of a larger objective, such as mass mobility in the service of economic growth. Most passenger rail advocates over 50 have some recollection of how Amtrak got this way. Congress hammered Amtrak together hastily in 1970, not to create a modern passenger train system, but to save the failing freight rail industry from massive passenger train deficits that already had plunged one-third of the country’s rail mileage into bankruptcy. Congress wasn’t really trying to save the nation’s passenger trains. It was trying to save the privately owned railroad industry from additional bankruptcies and eventual nationalization. This short-range defensive tactic worked: The federal government’s assumption of passenger trains and their deficits gave the nation’s privately owned freight railroads the oxygen they needed to survive for a decade until deregulation allowed the industry to sit up, breathe on its own, dangle its legs over the edge of the bed and start eating solids. But the little passenger railroad that saved the freight trains was not itself expected to survive. As Rush Loving makes clear in his magesterial The Men Who Loved Trains, President Nixon agreed to sign the 1970s Railpax legislation that created Amtrak only because the congressional aides who drafted it persuaded him that Amtrak would last only about five years. 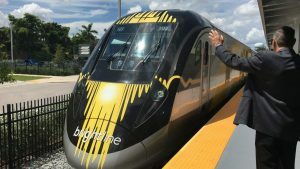 Passenger train ridership had been slumping since the end of World War II, and as the nation transitioned to Interstate highways and jet travel, the slump turned into a plunge that all the experts deemed irreversible. No business had ever survived what amounted to a mass repudiation by its customers, and there was no reason to suspect that a battlefield tourniquet like Amtrak could staunch the hemorrhage. Because Amtrak was expected to go out of business, there was no attempt to reform it, update it or find a permanent place for passenger rail in the nation’s larger transportation policy. But a funny thing happened on Amtrak’s way to extinction: success. People confounded the experts by starting to ride the trains again. Congress, the Administration and the railroad industry couldn’t believe it, and most of them still don’t. Loving provides a hilarious account of how Washington’s decision-makers and the Class I railroads who were depending on them stood blinking and squinting like moles dragged out into the sunlight when predictions of the passenger train’s death proved exaggerated, and Americans started riding the trains again—and demanding more trains. Amtrak didn’t know what to do. And it still doesn’t, because the decision to run more passenger trains over more routes to more destinations is not a commercial one that can be made by a corporation—even a federally owned corporation. 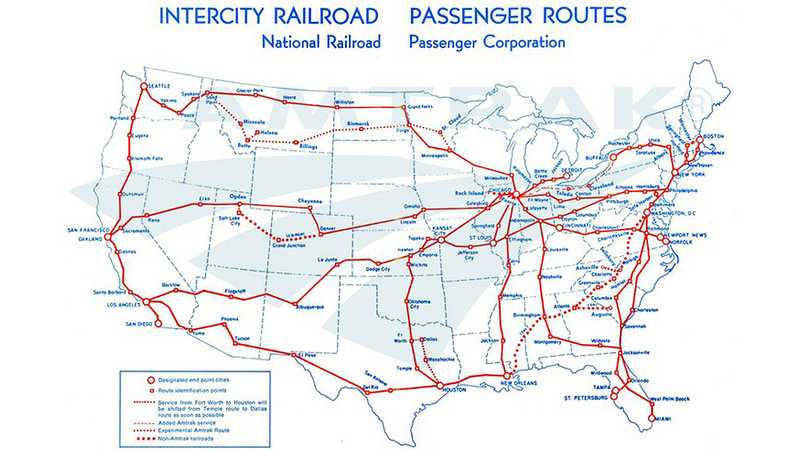 It’s a high-level policy decision that can be resolved only by the establishment of a new National Transportation Policy that positions passenger train development at the same level of importance as highways and civil aviation and creates a new passenger rail policy and development organ occupying the same line on the USDOT org chart as the FHWA and the FAA. The job of the new agency—call it the Federal Passenger Rail Administration—is to identify routes needing passenger train service, develop a budget to fund the required infrastructure, and establish rules under which private-sector entrepreneurs can run trains over them. These tasks cannot be assigned to Amtrak. Amtrak is a company, not an “administration” like FHWA, FAA or MARAD, with a solid-line connection to the Secretary of Transportation and a budget and charter to build things. It is a barely tolerated guest on infrastructure owned by private railroad companies. It lacks government authority to commandeer Class I property or to build its own tracks on surplus rights-of-way the Class I’s are not using. By federal transportation standards, Amtrak is an organizational cripple, yet it remains subjected to a metric from which highways and civil aviation are exempt: profitability. The “mission gap” between Amtrak and the other two modes is a recipe for mischief, and in Richard Anderson the recipe has finally met its master chef. We have come as far as we can with the Amtrak model. It’s time for Congress to pass an updated Transportation Act creating a Federal Passenger Rail Administration that will have the same authority, governance, mission, status and access to funding as the three other boxes on the USDOT org chart: FHWA, FAA and MARAD. Would elevating passenger trains to statutory parity with highways, civil aviation and waterways be difficult? You bet. A long, punishing campaign for legitimacy is the historical norm in the evolution of new federal transportation programs. Two presidents—Andrew Jackson and James Monroe—vetoed highway bills, claiming the Constitution gave the federal government no authority to build or manage a national road network. Only the overwhelming opportunity presented by automotive technology 100 years later (and the 1916 near-collapse and temporary nationalization of the U.S. rail system in the face of the World War I emergency) forced the federal government to find a way to make highways happen. Forty years after the U.S. faced its highway challenge, a rapid advance in passenger airliner technology again forced the federal government to embrace big-time transportation infrastructure funding. Shortly after his 1953 inauguration, President Dwight Eisenhower declared, “It is time for the federal government to begin an orderly retreat from civil aviation.” Ike was consumed by his dream of an Interstate highway network, but he had something of a blind spot when it came to the airline boom that was going on right before his eyes and spent most of his Administration trying to wriggle out of funding airways improvements. But by 1958, with passengers clamoring for seats on bigger, faster, more comfortable DC-7s and Constellations and Boeing’s new jet-powered 707 ready to enter service, Ike had to yield by creating the Federal Aviation Administration. The boom in demand for air travel had overwhelmed the nation’s primitive and fragmented air traffic control technologies, causing a decade-long series of crashes that killed more than a thousand passengers, crew and bystanders on the ground. The FAA’s mission was to build a way out of the carnage and tragedy with a uniform, nationwide, technologically modern air traffic control system of infrastructure and personnel. Today, the U.S. faces a third transportation emergency characterized not by sudden breakdowns as in 1916 or the appalling epidemic of fatal airline crashes between 1952 and 1961, but by a long twilight mobility blight in which American travelers lose millions of hours per year stranded on backed-up highways trying to reach congested airports, where they will lose another hour in a bovine shuffle through a tedious security ritual that has turned the speed and convenience of air travel into a national joke. Clearly, the time has come for trains. But first, passenger rail advocates will need to understand that their travails are not unprecedented. Obstacles—historical, statutory, commercial, political, legal, even personal—are the norm not only in developing federal transportation policy, but in legitimizing a policy. Highways were hard. They were not seen as the responsibility of the federal government. Airports and air traffic control were hard, because Ike believed cities, states and the airlines could develop them without federal help. The “interim solution” of the 1970 Railpax Act isn’t working anymore. The “interim” that birthed it is over, and we’re in a new age with new problems and new opportunities. The high-speed electrified train has proven itself across the Eastern Hemisphere and Europe. No longer can it be barred from the Americas. Neither can the coordinated networks of high-speed, conventional and commuter trains that have made Europe and Asia mobile, prosperous and safe both travelers and the environment. The message to the advocacy community is clear: Stop wasting precious time and resources trying to get Amtrak to behave like something it’s not: a federal transportation program. Stop trying to “reform” Amtrak, and stop playing the mug’s game of trying to “save” threatened trains. Amtrak was never designed to be anything more than an exit strategy from the rail industry’s deficits. Passenger rail advocacy that tries to “fix” Amtrak train by train (or meal by meal) while ignoring the need for fundamental policy reform has turned into a bizarre behavioral psychology experiment in which the pigeons keep pecking at the lever even though no more corn comes out. We need to switch from the 1970 rescue model to a 21st-century USDOT agency model designed to build a modern passenger train infrastructure on which private, for-profit companies can operate trains. With the early highway and civil aviation advocates as their models, passenger train advocates can switch from struggling pointlessly to struggling and winning. That means passing a new National Transportation Act with all the statutory, budgetary and bureaucratic resources needed to take passenger trains into the post-Amtrak world. With some focus, clear thinking and effort, trains in the rear-view mirror may be closer than they appear. F.K. Plous is Director of Communications at Corridor Capital LLC in Chicago.